These pull apart stuffed bread rolls make us wish we made bread rolls everyday. 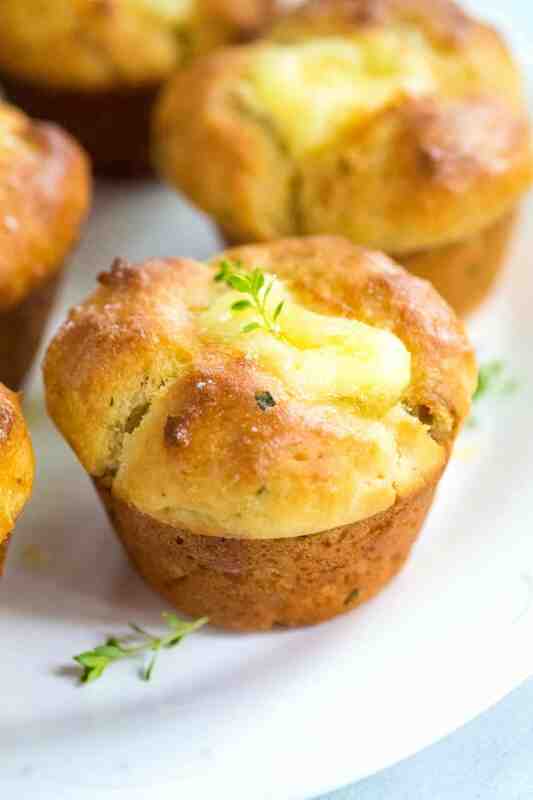 Jump to the Brie Stuffed Pull Apart Bread Rolls Recipe. 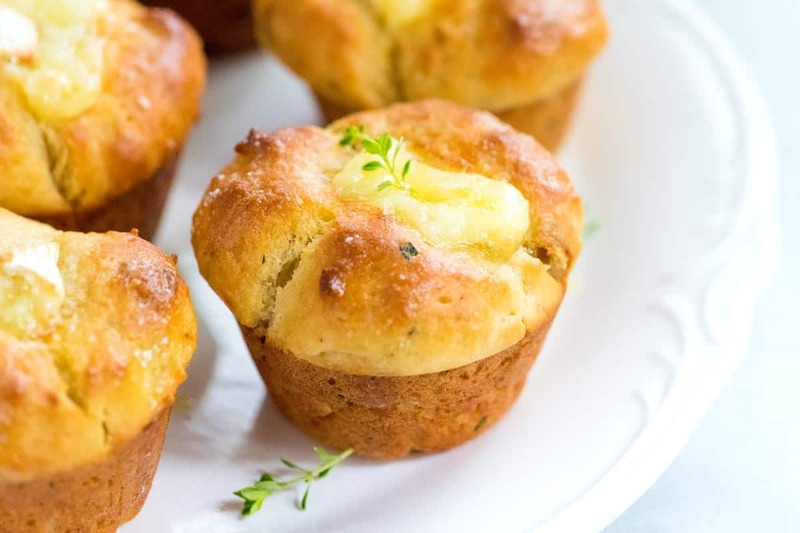 They’re naturally sweetened with honey, soft inside and because you know we can’t do anything “normal” they’ve got a slice of creamy brie cheese and fresh herbs in the middle. You will need to let the dough rise for 1 hour, but after that, they are no-knead, easy bread rolls! YOU MAY ALSO LIKE: How to make herbed focaccia bread that’s perfectly crisp on the outside and soft and chewy on the inside. 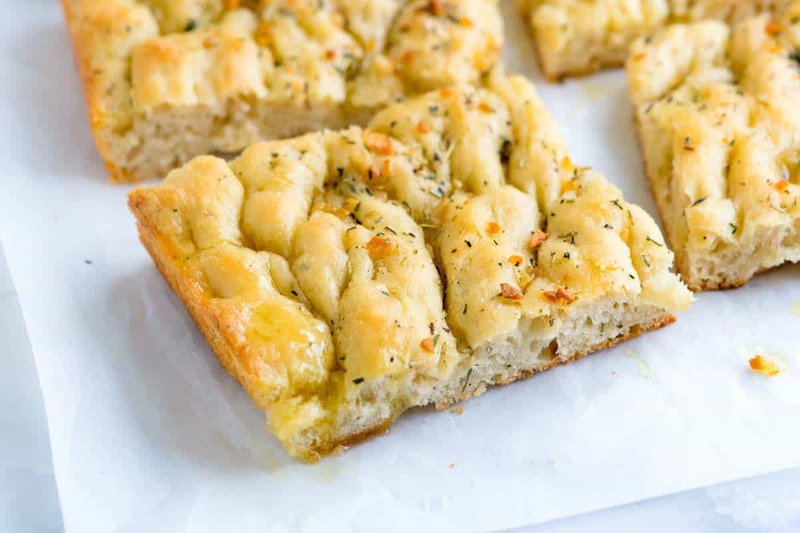 Jump to the Easy Focaccia Recipe. These really are easy to make. The hardest part is making sure you have enough patience to wait an hour for them to rise. Other than that, they’re a cinch! Start by dissolving honey into milk and olive oil. Stir in yeast and flour then cover the pot and wait about an hour until the dough doubles in size. After an hour, stir in more flour, baking soda, baking powder, salt, and lots of fresh herbs — I like a combination of rosemary and thyme. When the dough comes together, form it into mini balls. 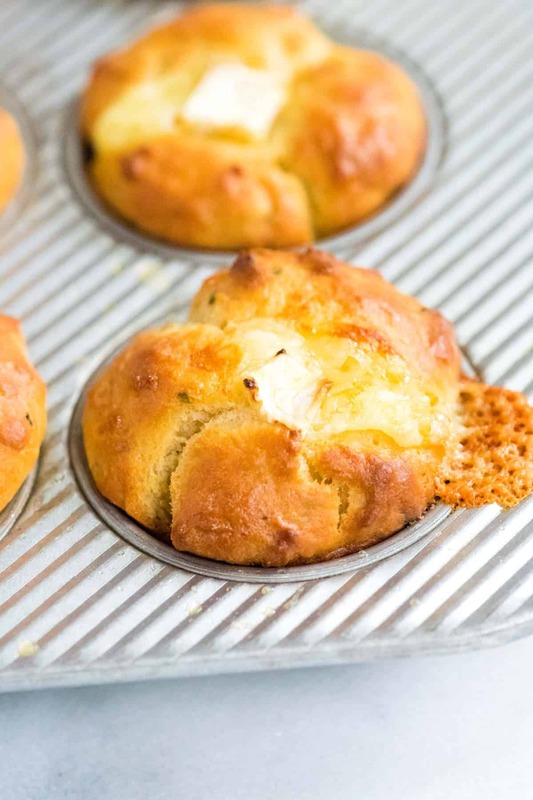 Since we love pulling the bread apart, we add three of the mini balls into each muffin cup. This way, when they are baked they are just begging to be pulled apart! Oh, and let’s not forget that it’s a good idea to sneak in a piece of brie cheese into the middle before baking. Not bad, right? So simple and can you even begin to imagine your family and friends faces when you come out with a big basket of these rolls!? Winner! 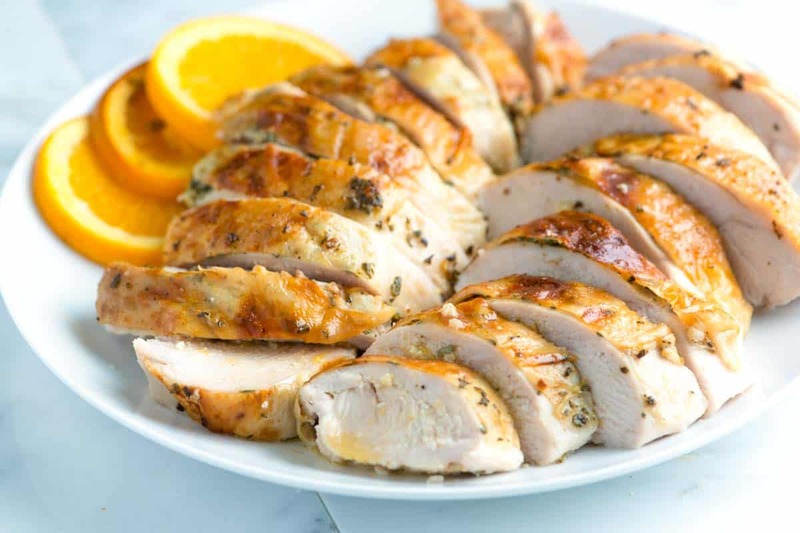 YOU MAY ALSO LIKE: How to make perfectly juicy oven-roasted turkey breast with garlic, herbs, and orange. Jump to the Garlic Herb Roasted Turkey Breast Recipe. These soft and stuffed dinner rolls will fly off the plate. Only one hour is required for rising, but nothing else. No kneading is required! Add the milk, sugar and olive oil to a 3-quart saucepan. Place over medium heat and cook, stirring often until the honey dissolves into the milk and oil. Remove from the heat and let cool until you can place the tip of your finger into the liquid and hold it there for a bit, without feeling like it’s too hot. (The liquid should be between 90 and 110 degrees F). Stir in 2 cups of the flour and the yeast. Cover and let rise until doubled in size, about 1 hour. 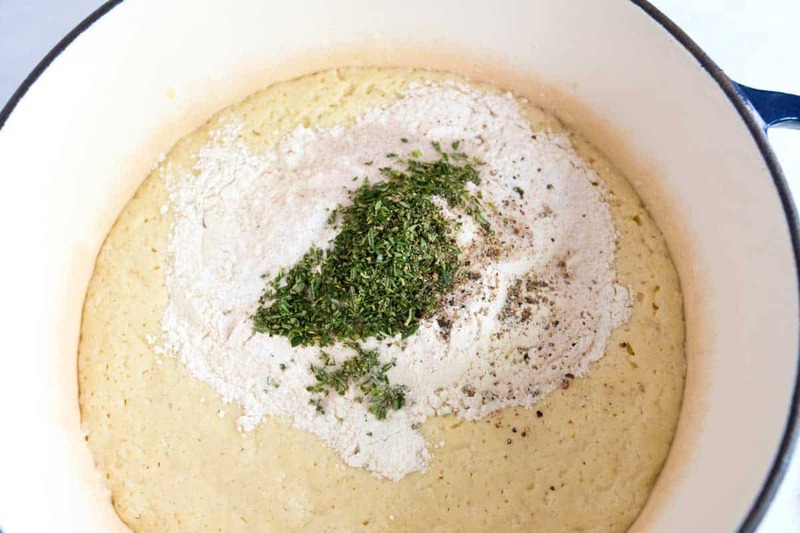 Stir in the remaining 2 1/2 cups of flour, the baking soda, baking powder, herbs and the salt. Heat the oven to 400 degrees F and lightly grease 18 muffin cups with olive oil. Roll dough into 1-inch balls — you will need 54 balls to make 18 rolls. Place three balls into each muffin cup. Push 1 cube of cheese into the middle of each filled muffin cup, pushing most of it under the tops of the dough balls. Bake the rolls until golden brown, 16 to 20 minutes. 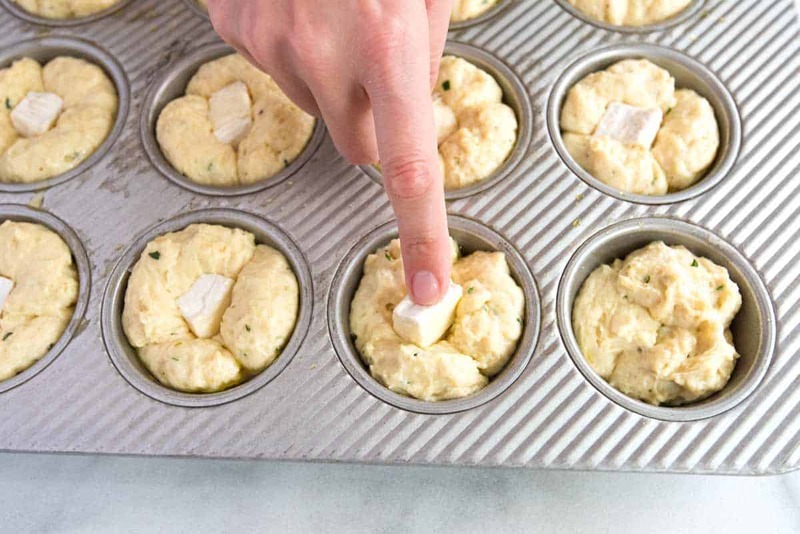 Remove from oven then push any cheese that has overflowed onto the muffin tin back on top of the rolls. Cool about 10 minutes in the pan then transfer to a cooling rack and cool completely. 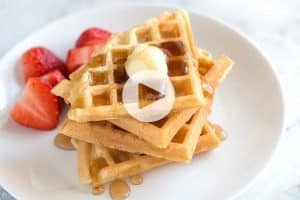 Serve with a little melted butter brushed on top. I made these today, and they’re very nice. Just a couple of things – this is a very wet dough. If someone isn’t a seasoned bread maker, it might be helpful to add some instructions for how the dough should look during mixing, and tips for handling wet dough. I tried mixing by hand, and it was just soupy, so I switched to the stand mixer with a dough hook, and let it run for a good ten minutes before the dough started to come together. I used water on my hands during the shaping, and had much better results than floured hands might’ve given. Other than that, this was an easy, delicious recipe. Thanks! Do you think the texture may change if I reduce sugar? It may, but the recipe is pretty flexible. You should give it a try. Was looking for recipe ideas and your website popped up. I haven’t made anything yet but you are combining some interesting things – and not too complicated. I’ll be looking here again! Loved your rolls. Avid bread maker, they will be a standard! Any recommendations if one wants to make these a day or two before Thanksgiving in regard to the best way to keep these little guys fresh? 🙂 I work retail and work up to 10pm the day before Thanksgiving! 😛 Limited amount of time right around “day of” :). Hi there, Sure! After baking, cool the rolls completely then cover them tightly with plastic wrap, foil or place into an airtight container. If you slide that into the fridge then they should stay fresh 2-3 days. Once you’re ready to serve, heat your oven to 350F and warm them up. I just made dinner rolls and I am in love with the recipe – until I see yours and they have brie and rosemary! Oh wow, that is an amazing combo! We love that! Now, we’ll be thinking of you both making bread this weekend. So cool! Haha, it’s so true. I always mean to make my own bread, but it just never ends up happening. 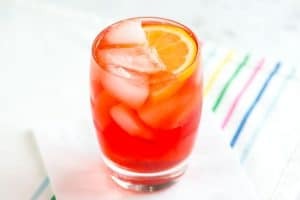 This looks fantastic by the way, I definitely want to make these sometime! I know! Wish we did it more often! Anything that is bread stuffed with cheese is a winner in my book! We used Red Star Active Dry yeast. One of my favourite bread recipes is a rosemary beer bread that is so simple, but so impressive. Homemade bread is actually not as hard as it seems and you’re reminding me I should do it more often! These look great! Rosemary beer bread sounds wonderful! Nooo, don’t leave out the brie! I bake bread when I have the time, but I’m always on the look out for easier recipes too. These sound perfect. Thanks and don’t worry, we’ll always add more brie! Oh, I will have to try these! You and I were certainly thinking the same way this week! Love the simplicity and the flavors!